O.K Subramaniam. (Nadaswaram). This is a temple instrument from the South of India and is the counterpart to the Shenhai of North India. Subramaniam's playing instantly struck me as having similarities to jazz horn players and from then on he was my Miles guy. Hari Das is a Santoor player and is a student of the most famous Santoor player Shiv Kumar. The santoor is a wonderful instrument with over 90 strings and has a delicate and romantic sound. It takes eons to tune. Hari will be doing an ambient Santoor record with Drongomala in 2006. A. Balakrisna Kamath (Mridangham). Balu (his short name) is one of the best mridingham players in the South of India. The mridangham is the two sided instrument you see Balu playing there and it is said to be the primordial drum into which creation was brought into being with. 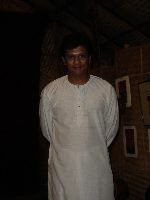 Vinod Kumar D (Ghanjeeram). The Ghanjeeram is a deceptively simple looking instrument. This tambourine like instrument can play extremely low sounds in tandem with it's jangling tambourine bells. a small rucksac and this drumkit is good to go. 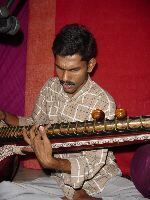 Soundarajan (Veena). The Veena is a south Indian classical instrument and is the precursor to the sitar and many other stringed instruments through Asia/Persia. Soundarajan is a Classical music teacher in Chennai and also one of the funniest sessions that I had during the time,. He loved the punchbag out the back. Dean Mohan (Tabla). Dean's has a group of tabla students that are devoted to him with good reason - super serious about music and a comic when there are no drums around. A.R. 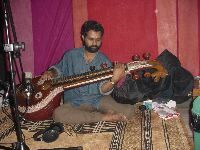 Biju played Veena on the track Out of Them All and also for the whole of the 100 Fields record. I think he is a rising star of the south - we'll try and get him to do some special pieces for Flying Mountain. SreeKumar Kalamandalam Chenda. This instrument is used in the folk dance and storytelling of Khatakhali. The Chenda drummer watches from the side of the stage and drums the movements of the actors and punctuates dramatic points. The noise levels on this puppy had me ringing for a few days. SreeKumar sweated his skin off playing this drum to some of the more frantic pieces on Scale. Dionyssis Konstas- drum kit. A literal legend on the island of NAxos Dio is a jazz/rock/funk/salsa or whatever you want him to be. He plays in three or four bands in Athens and will be releasing a CD in the next few months. We think he rocks - his hair is genre busting too. Anna Lauvergnac - backing vocals. a little angel from Italy. Anna sings all over and most recently with the Vienna Art Orchestra. 'Scale' came to life in many locations including Kerala in South India, a Greek island and the UK, before being mixed in the famous Hyde Street Studios in San Francisco - a life-cycle that gives the album a truly border and genre-busting feel. This exciting new release makes a break from the hyped dynamics of today's records with orchestral style dynamics. Richness comes from collaborative performances by some of the top Indian classical musicians in the southern Indian region of Kerala. All is finally unified by Drongomala's powerful emotive voice and acoustic guitar. Opening with the fanfare of 'Rise and Fall' the stage is set for the album's themes of power, love, addiction and disconnection. 'Be A Bird' has a Nick Drake influenced mood of gentle introspection, 'Money' hosts a broken and bluesy feel reminiscent of early Beck records, 'Poppy Flower' phases in and out of focus like a drug dream surrounded by beautiful Santoor playing while 'Out of Them All' takes an 808 drum machine and flute for a ride through dreams of gold and the confusion of choices in life.